Refreshing your Point of Sale is a practice we recommend you do every day before you open and every night after you close. Refreshing the POS on a regular basis keeps the system healthy and running smoothly. If you make any changes in the Management Console ([yoursubdomain].revelup.com), whether you add 100 new products or change just one setting, you have to refresh the POS in order to see your changes. Navigate to the POS login screen. If you are currently logged in, tap the gear icon in the top left corner to open the Settings menu and choose Log Out from the drop-down (QSR and Retail) or tap the Log Out button on the top right side of the screen (TSR). A black window will appear that says Downloading Configuration. The refresh duration is dependent on how many changes you have made in the Management Console. Once the refresh is complete, log in to the POS. You should see your new changes. 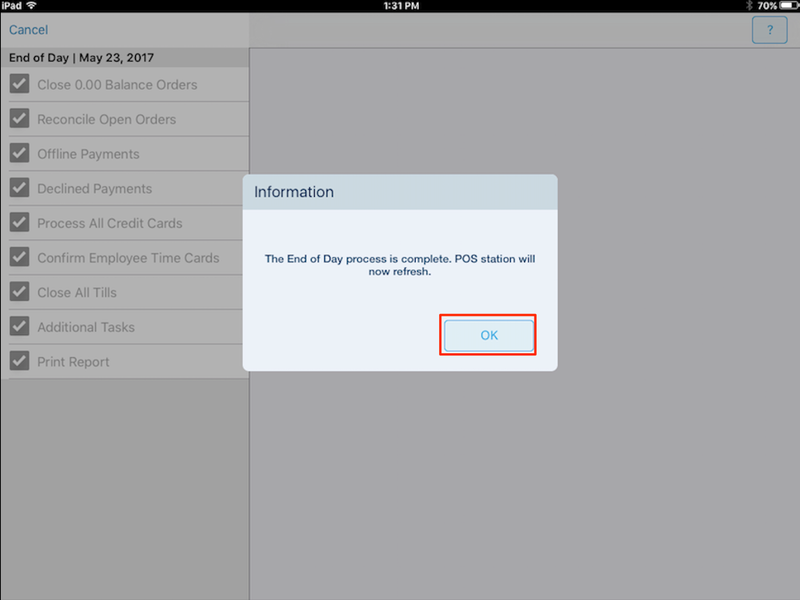 If you have multiple POS stations or mobile order takers, make sure to refresh each POS individually. In your Management Console, go to the Settings tab and click Clear Selections. In the search bar, type Refresh. 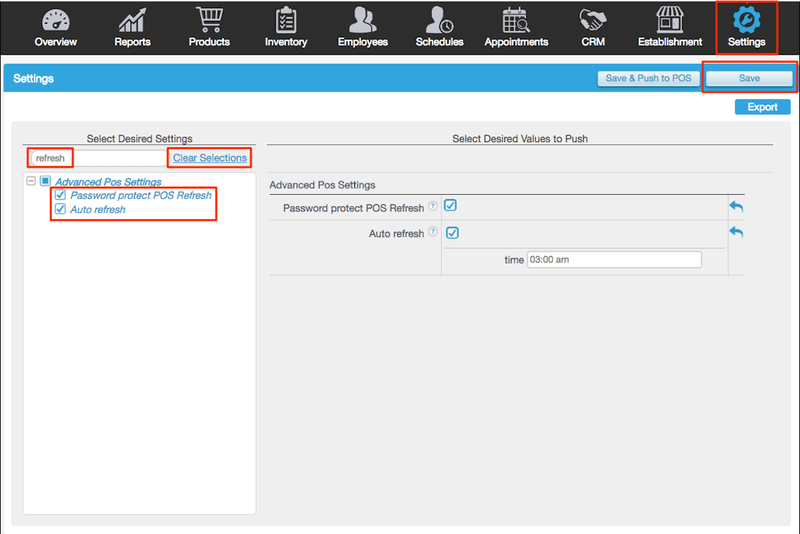 Check both Password Protect POS Refresh and Auto Refresh. 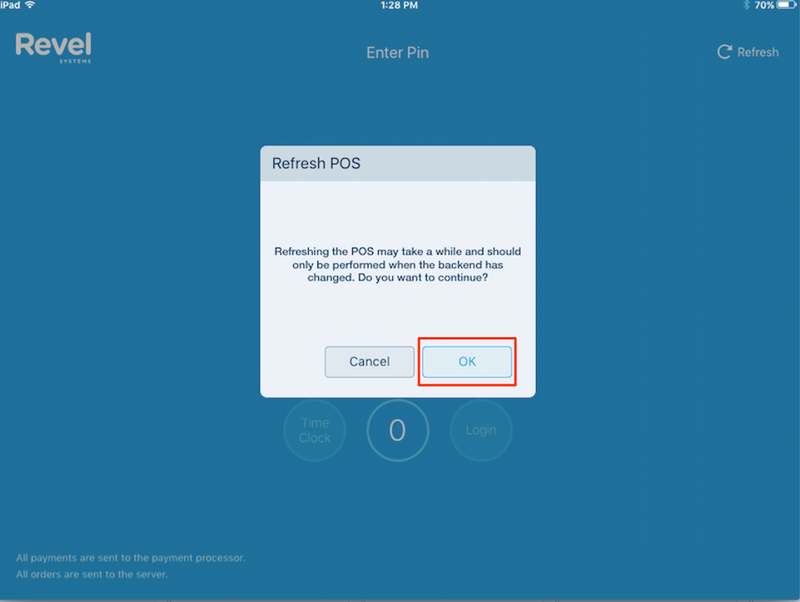 If you enable Password Protect POS Refresh, the POS will require an employee to enter their PIN upon every refresh. Only employees with permission to perform a refresh will be able to perform this function. This can be managed in the Management Console under Employees > Role Permissions. Auto Refresh allows you to set your system to refresh at a specific time each day. It is recommended to set the hour for a time you will be closed, such as 3:00 AM.